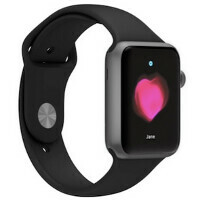 Apple Watch focus of two stories for U.K. magazine "Style"; device gets mentioned in "Foxtrot"
Last week, we told you about an invitation that Apple sent out to announce a March 9th event at the Yerba Buena Center for the Arts Theater in San Francisco. Since the invitation mentioned Daylight Savings Time (which restarts the day before), it is pretty clear that the subject of the event will be the Apple Watch. The timepiece recently was seen on the cover of Vogue Paris. It was also featured in a 12-paid advertisement spread in the U.S. edition of Vogue. Apple sees its timepiece as being part fashion icon, part tech superstar. On Sunday, the wearable was the subject of two separate stories for the U.K.'s Style magazine. This is a special section that comes with The Sunday Times. The spread included a picture of model Guinevere Van Seenus wearing the Space Gray Apple Watch Sport, quoted at $349. There had been some rumbling recently about the Space Gray model having a premium price. If the magazine is right, that speculation is false. Also, Apple Watch managed to get a mention in one of the funnier comic strips out there, Foxtrot. Looks like young nerd Jason Fox has an idea how to make money off those who can't quite afford an Apple Watch. This could be a subtle crack at the price of the high-end Apple Watch Edition, which will be priced in the thousands of dollars. A perfect watch for women,hipsers and gay people but fugly for average user. March 9th come on, and hurry up already. This watch is going to take Apple to new highs. A watch is not a cell phone. Because you wear it, it is a fashion statement. A lot of people like me who don't care about Apple Cell phones are going to want it. Does it have to work we a cell phone or is it a standalone watch?? If Apple next cell is as good as the upcoming Note 5 a lot of people are going to switch to Apple. Samsung needs an European to design their watch. They need to hire someone from Cartier. A nice watch will sway a lot of people.